ck out this step-by-step guide on How to Remove Tile Flooring. A great winter home improvement project! There are plenty of reasons that you may need to remove your tile floor. Perhaps it cracked when you were moving your refrigerator. Or maybe it’s a bit too slick when you’re getting out of the shower. Or possibly you just want a change. So, what’s the best way to remove a tile floor? 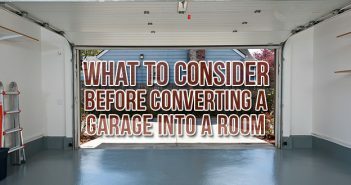 We’ll show you how it’s done in five easy steps — but first, here are a few things to keep in mind before you get started. The cost to remove a tile floor depends on a number of factors including the size of the room and whether you’re looking at a DIY tile removal or hiring a contractor. Homewyse has a handy tile removal calculator that will give you a general guideline on costs, but keep in mind the price given will be with a contractor doing the work. If you pull up the tile yourself, your costs will be kept to the tools used and the tile disposal. While the project itself is relatively easy and simple, it will be quite time consuming and physically strenuous. The added difficultly comes with the rooms you’re working on, and what may need to be uninstalled or removed from the area — but more on that later. Just as important as having the proper tools for the job is having the proper gear to keep yourself safe. 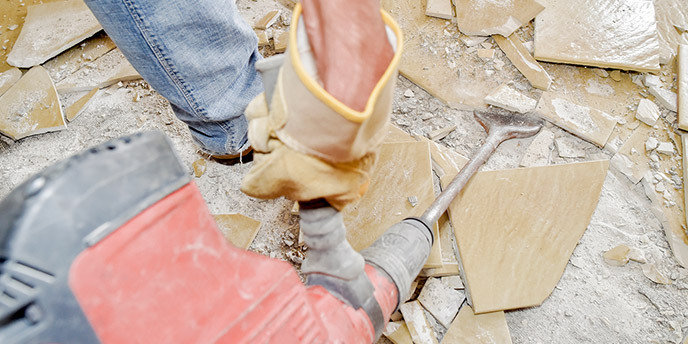 Tile can be extremely sharp when broken, so long-sleeved shirts and pants are suggested. Gloves and safety goggles should be worn at all times, even through the cleanup phase. Finally, a safety mask is also a must. The tiles will create a lot of dust that you don’t want to be breathing in. Should I Remove Asbestos Tile Myself? Removing tile flooring is a relatively safe project, unless you’re dealing with asbestos floor tiles or adhesives. Daniel King, from The Mesothelioma Center at Asbestos.com, says that while these types of tiles are not dangerous while intact, the danger lies when they are removed. King also notes that while vinyl flooring tends to be the most at-risk of containing asbestos, it is possible that the glue holding the tiles in place may contain asbestos. King suggests having an asbestos abatement professional inspect any floors you are unsure of. He also says that a sample of the material could be sent to a lab for testing, but that you need to exercise caution while getting the sample to avoid breathing in any dust. “I always recommend leaving asbestos removal to professionals,” King says. Before you dive right in and start pulling up tiles, you need to get your rooms ready for work. This is a fairly quick process that will help set you up for success while ensuring you don’t ruin your possessions. Remove free-standing items: Whether it’s an umbrella holder or a coffee table, it needs to get out of the room. After all, you’ll be removing the old tile that it’s sitting on. And, while you’re clearing the room, it might not be a bad time to consider throwing some stuff out to declutter your home. 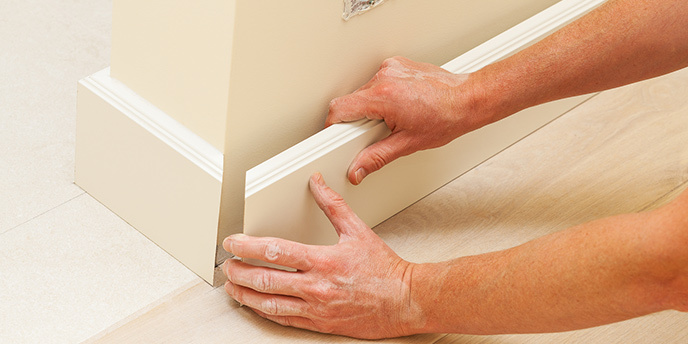 Take off any baseboard trim: Using a screwdriver or hammer/pry bar combo, remove any baseboards that might be on your walls. 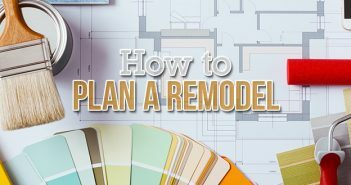 Be sure to do this carefully, as you’ll probably want to reinstall them once your tile removal job is done. Seal the vents: As noted before, removing tile floors is a dusty job. You don’t want your air system to get clogged with pieces of tile and debris. Use plastic wrap and painters’ tape to seal off your vents. Cover what you can’t move: If there are items you can’t move, but don’t want to get covered in debris — such as a kitchen island or built-in shelving — use a tarp to cover those items. 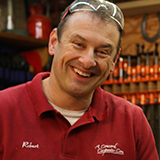 Additionally, Robert Robillard of A Concord Carpenter, LLC, says that having space is key when it comes to removing tiles. In other words, anything that can be removed should be, even if it requires a bit more effort, because it will save you time in the long run. You’ve got to start somewhere, but that doesn’t mean it has to be tough. 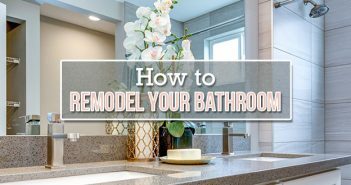 According to Robillard, host of the Boston-area DIY TV show “A Concord Carpenter”, the rule of thumb here is to try and find a place where tile may already be nonexistent, like under a vanity or another fixture. Another great place to start is a spot where the old tile may be loose or cracked, which will allow you to pull up the tile much easier. Unfortunately, these types of spots are not always there, and you’ll have to create your own starting point. If that’s the case, a corner of the room or doorway where the tile does not continue into the next room is usually the best place to start. Break apart the first few tiles using your chisel and hammer. Remove the broken pieces and place them in a bucket. You don’t need to worry about getting every piece, but getting the bigger chunks out of the way will help in the long run. Inspect the underlayment of the floor to make sure there is no damage. Use a pry bar to pull up tile that isn’t easily removed. This is where the real work begins. When to start it, though, will vary from person to person. Once you have removed enough tile to comfortably use either your long-handled floor scraper or air hammer with a chisel set, it’s time to get the bulk of the work done. Use your tools to get underneath a tile and pry it away from the underlayment. Don’t worry if the old tiles break — some will come up easier than others, but all of it will be getting tossed. Don’t use too much force, as it could result in damage to the floor or even personal injury. Use a shovel to scoop up bigger chunks of tile and dump them in a bucket. As you get closer to removing tiles that are near a wall or cabinets, consider switching back to a chisel and hammer to avoid damage to those surfaces. Remember, this part of the process will take a decent amount of time. Don’t be discouraged if it’s taking longer than you would like. Now that the tiles are all removed, it’s time to take a look at what’s underneath. Typically, you’ll find a layer of underlayment – material that sits between your subfloor and your finished flooring. But if you’re working in your basement or an older home, you may find that the tile was installed directly to a concrete or wood floor. The main reason that plywood is no longer considered the best underlayment for tiles is because it is absorbent and will expand with moisture, which can cause a ridged material like tile to crack. However, for flooring types like vinyl or linoleum, plywood is still a fine underlayment. If the plywood underlayment and subfloor panels are in good shape, you can reuse it if you’re installing other flooring materials. When reusing existing underlayment or removing tile from a wood or concrete floor, it’s important to know how to remove floor tile adhesive properly. Cover the patches of adhesive with a citrus-based adhesive remover. They can be found at most home improvement stores. After waiting the recommended time period for the adhesive remover product, use your scraper to work up the loosened material. If your tile was placed with tile mortar or thinset — both of which will look like cement — you may need to use a chisel and hammer to chip away the larger pieces. Throw patches of removed adhesive into a bucket. Continue until all floor tile adhesive has been removed. Pro tip: Be sure to keep the area well ventilated by opening windows or using a fan. Remove any screws that you can see. Use your pry bar to work the underlayment up. Don’t worry if it breaks, as you won’t be reusing it. Continue prying until the underlayment has been completely removed. Important safety tip: There will be a lot of nails in the underlayment, so be careful as you pick up the pieces to throw out. 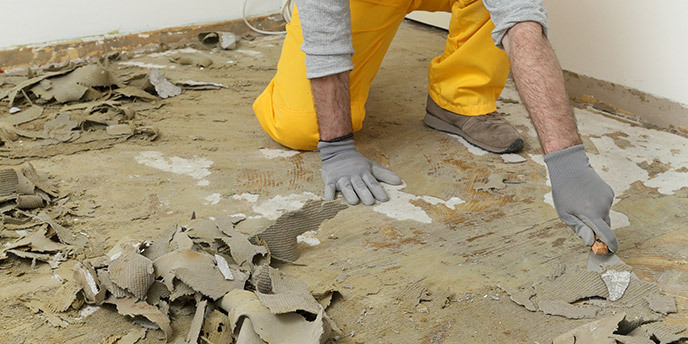 With either your underlayment or subfloor exposed, it’s time to clean up the mess. Take your buckets filled with old tile, adhesive and underlayment chunks and throw them out. If your project was larger, consider a dumpster rental for tile disposal, rather than wait for your next bulk trash pickup day. 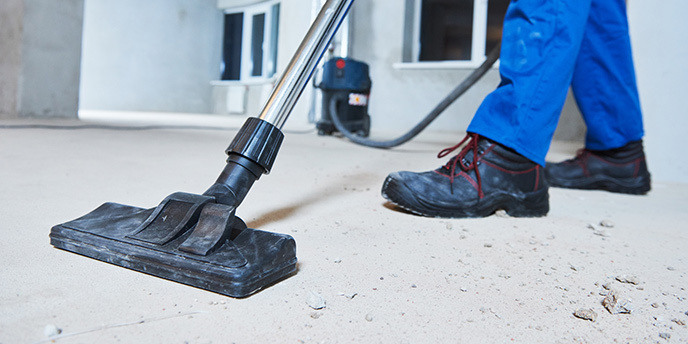 Use your shop-vac to vacuum up smaller pieces of debris as well as dust. You won’t want to rush this step, as it is one of the most important when it comes to installing your new floor. Any dust that has not been cleaned from underlayment or subfloor will make it harder for a new floor to properly adhere to the surface. With the tile removed, the next step is up to you. How will you replace your old tile floor? With plenty of other flooring options available, you can’t go wrong. Looking for a different type of floor? Hardwood is a solid choice. Our Hardwood Flooring Guide walks you through the different wood options, as well as how to install and maintain it.